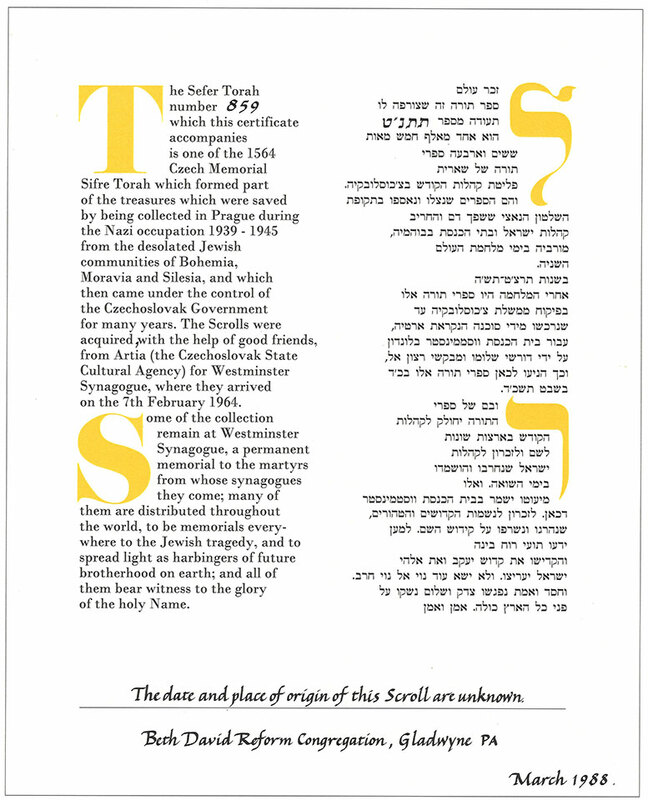 The origins of Sefer Torah #859 are unknown, however it is one of the 1564 Czech Memorial Sifre Torah rescued by being collected in Prague during the Nazi occupation 1939 – 1945, and is on permanent loan to Beth David from the Memorial Scrolls Trust located in London, England. In March of 1988, congregant and Past President, Martin Weinberg, presented the Shoah Torah to Beth David in memory of his late wife, Ethel Weinberg. He writes: When my wife (prior to Susan) died in 1987, and the dust had settled, after Sheloshim, was this the end of a lifetime? In her 38 years of life she had been transformed from a 100% secular Jew, with no knowledge of Judaic religion or tradition into a rudimentary speaker of Hebrew, a teacher at Solomon Schechter Day School and an avid student of Jewish ritual and prayer. She had even spent time in Jerusalem at Hebrew University, becoming immersed in all things Jewish. Rabbi Cohen, in many ways became her mentor in absorbing Judaica. On her grave marker I tried to describe how her knowledge, compassion and understanding had influenced all those who knew her. Through the efforts of Walter and Ethel Hofman (a later president of Beth David) we became aware of the location of the Torah repository in London. Since Ethel was Scottish by birth, they had been making frequent trips to Great Britain. On one of their trips they went to the repository and arranged for us to get a Torah. We had a very emotional service at Beth David when we received and dedicated the Torah. To make it more personal, I constructed a Torah cover from a tallit and affixed to it a “star of David” rescued from a “survivor”. The belt holding the scroll belonged to Phyllis. 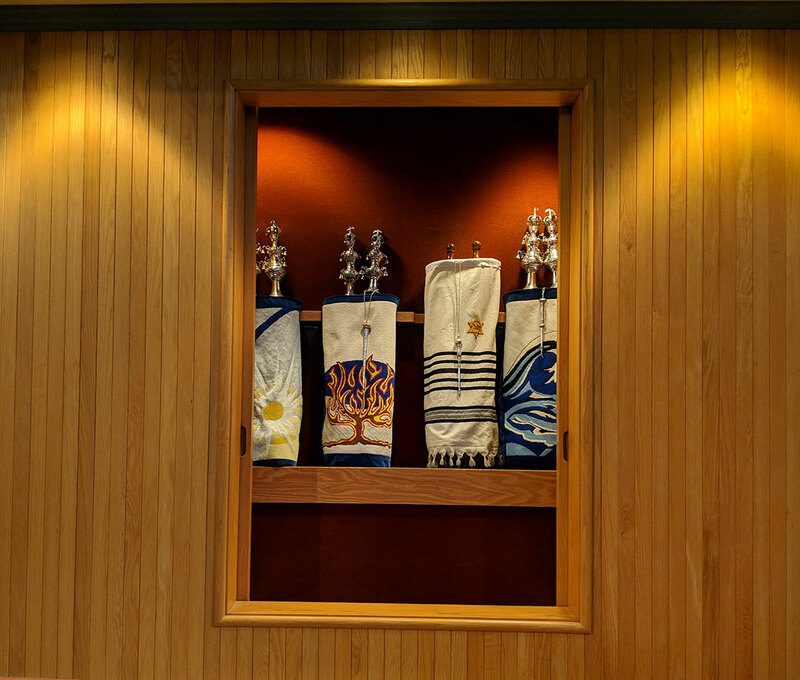 The “neshuma”of Phyllis continues to reside in the ark, in the physical form of this Torah. May its sanctity persist forever. 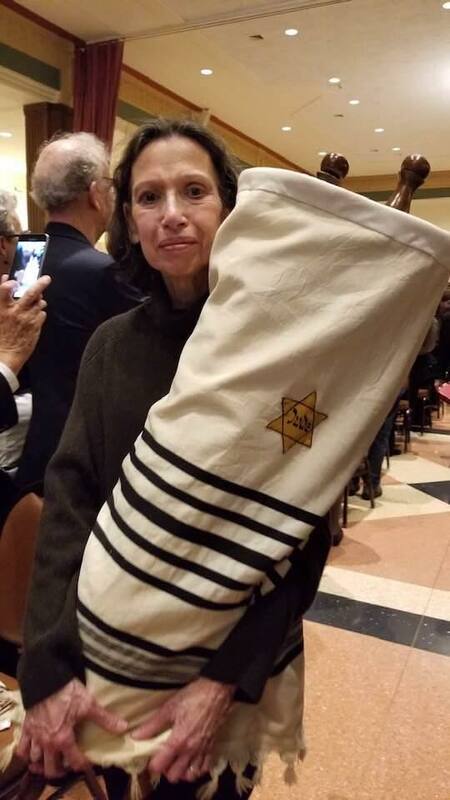 In February 2019 in New York City, Beth David participated in a remarkable reunion of Holocaust Torah Scrolls from the Memorial Scrolls Trust. This first-ever reunion attracted 800 people and included a moving Hakafah (procession) of more than 70 scrolls from over 10 different states and countries. Susan Levey, Educator Emeritus, was privileged to carry our Torah. The Holocaust Torah is dedicated to a person who cherished its teachings, shared its sufferings and whose ‘neshumeh” is linked to those she touched.